We know by now that a workplace should inspire and motivate the people who work within it. Studies (by the University of Exeter and British Council for Offices) suggest that, as well as boosting staff morale and promoting wellbeing, a conducive and appealing working environment can significantly up productivity, and we know that art plays a part in that. But once these spaces have been designed, created and the artwork installed, what next? How do we continue to stimulate creativity and promote wellbeing at work through art? What do people need? Beyond physical attributes of a well designed workplace, such as access to natural light, ergonomic furniture, different work zones, free refreshments, breakout and leisure space, It’s about feeling part of something: Being part of a community. A well considered and varied art programme will successfully engage, include and challenge, it will galvanise a feeling of belonging as well as encourage individuality and creativity. Temporary exhibitions, artists talks, workshops, running an art prize or bursary can all be managed on modest budgets on a year by year basis, with far reaching effects. The event featured the first public screening and external launch of CMS’ own ‘This is Me’ film featuring 11 CMS staff sharing their own experiences of mental health and illness, as well as a conceptual photography exhibition ‘In the Mind’s Eye’ by artist, Suzie Larke. Suzie’s art is inspired by her own experience of mental health and is part of CMS’ wider art programme: a series of temporary exhibitions and events arranged by Art Acumen that aim to ENGAGE & INSPIRE. The response to Suzie’s work has been really positive, it has been a catalyst for discussion and debate and the mechanism for people to feel part of something. For the ‘This is Me’ event, Art Acumen arranged for Suzie Larke and comedian Jayde Adams to join the panel to discuss how the creative process helped to externalise feelings when sometimes conversation had been difficult. The overwhelming message that prevailed from the wider panel discussion was that creativity – being able to express yourself as an individual – is key to wellbeing. 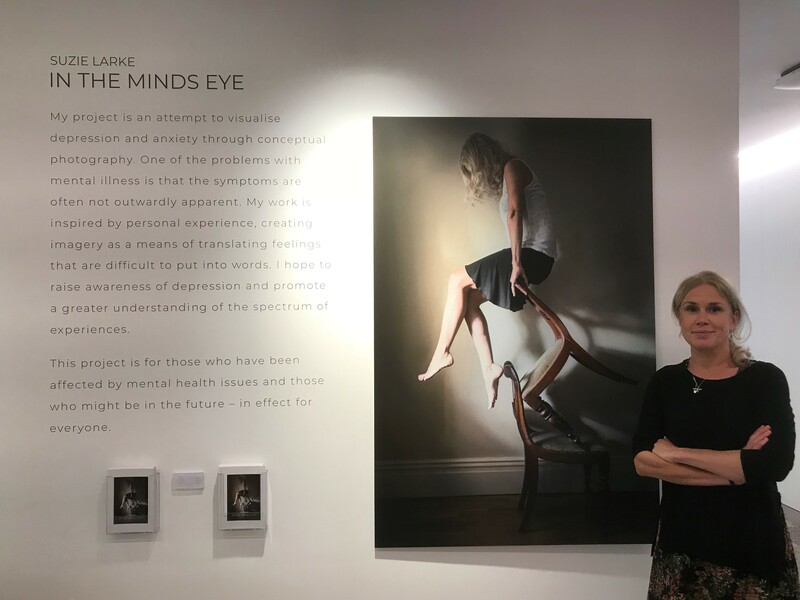 Suzie’s exhibition In the Mind’s Eye will be on display for CMS employees and clients to enjoy for three months at their London headquarters, after which it will embark on a tour of their other offices and will also be loaned to interested clients.